Eltronicschool. - Do you want to build your self the tester instrument in this time like to measure main voltage? when you want to build it, in here i will show you one of the tester circuit schematic for measuring or testing main voltage wirelessly look like in Figure 1 below. The main of the heart of the circuit component is CMOS IC CD4033. So, in here we will show you more about this circuit schematic of Main Voltage Wireless Tester using CD4033, and we will give you the component parts, and description of this circuit. Circuit schematic like in Figure 1 above is named Main Voltage Wireless Tester using CD4033. The main component to build this circuit is CMOS IC CD4033 that we think it is easy found in the electronic component market in your country. According Circuitstoday site that also published this circuit, describe that with this circuit you can test whether mains voltage is present or not without you having electric contact with mains line. 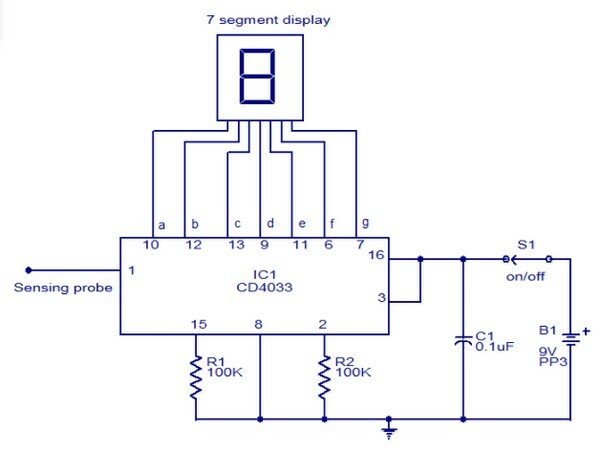 As the main component, the CMOS IC CD4033 consists of a 5 stage decade Johnson counter and an output decoder for converting the Johnson code to a 7 segment decoded output for driving 7 segment LED display. A 10cm long insulated copper wire connected to the clock pin (pin1) of the IC serves as the sensor. The sensor wire has to be placed in the vicinity of the mains wire to be tested. When there is no voltage in the mains line, no voltage will be induced in the sensor wire and the display will show a random digit. When there is voltage in the mains line, a small voltage will be induced in the sensor wire due to electromagnetic induction and this voltage is sufficient enough to clock the CMOS IC CD4033. It will count from zero to nine repeatly in the display seven segment.